INTRODUCTION: Adjustable gastric band slippage is a common complication following placement of a laparoscopic adjustable gastric band. Large slips of adjustable gastric bands often distort normal anatomy, generate adhesions and lead to significant edema of the gastric pouch, fundoplication and gastric fundus. In our experience, these factors have contributed to a high rate of complications following primary re-positioning or replacement of the adjustable gastric band. As a result, we have proposed, as an alternative therapy, unbuckling of the adjustable gastric band at the first procedure and re-positioning and re-buckling of the adjustable gastric band in a second operation. This approach leaves the adjustable gastric band in position, thereby keeping the posterior track intact and patent as well as preventing other complications. METHODS: From July 2008- August 2009, we performed 9 unbuckling procedures on patients that were diagnosed with large adjustable gastric band slips. We retrospectively reviewed hospital medical records and office charts of these patients. The patients ages ranged from 28-50 and they presented with band slippage 30.5 months (16-60 months) after initial band placement. The starting BMI for the patients was 45.7 (40-49) and upon presentation was 30 (21.5-42). RESULTS: Diagnosis of the slips were made with chest x-rays or video esophagrams. Three to four 5mm laparoscopic trocars were inserted through previous trocars sites. We divided adhesions unveiling the locking mechanism of the LAGB. 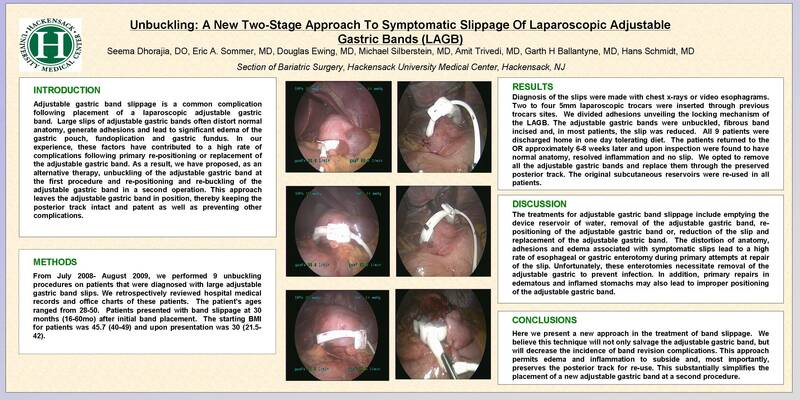 The adjustable gastric bands were unbuckled, fibrous band incised and, in most patients, the slip was reduced. All 9 patients were discharged home in one day tolerating diet. The patients returned to the OR approximately 8 weeks later and upon inspection were found to have normal anatomy, resolved inflammation and no slip. We opted to remove all the adjustable gastric bands and replace them through the preserved posterior track. The original subcutaneous reservoirs were re-used in all patients. DISCUSSION: The treatments for adjustable gastric band slippage include emptying the device reservoir of water, removal of the adjustable gastric band, re-positioning of the adjustable gastric band or removal, reduction of the slip and replacement of the adjustable gastric band. The distortion of anatomy, adhesions and edema associated with symptomatic slips lead to a high rate of esophageal or gastric enterotomy during primary attempts at repair of the slip. Unfortunately, these enterotomies necessitate removal of the adjustable gastric to prevent infection. In addition, primary repairs in edematous and inflamed stomachs may also lead to improper positioning of the adjustable gastric band. CONCLUSION: Here we present a new approach in the treatment of band slippage. We believe this technique will not only salvage the adjustable gastric band, but will decrease the incidence of band revision complications. This approach permits edema and inflammation to subside and, most importantly, preserves the posterior track for re-use. This substantially simplifies the placement of a new adjustable gastric band at a second procedure.